Diamonds, the ultimate gemstone to make your piece of jewellery that extra bit special. to the wearer of this precious stone. The word Diamond was adopted from the Greek word ‘adamas’ meaning invincible. magical powers of Diamonds are of great resonance. Some thought lightning bolts formed Diamonds, while other theories asserted that Diamonds were the tears of god. warriors invincible and fortified their muscles. Not only a symbol of strength, but the diamond is thought to provide the wearer with better relationships and to increase their inner strength. Wearing diamonds is purported to bring other benefits such as balance, clarity and abundance. It’s also symbolic of eternal love. The stone of commitment, faithfulness and promise. 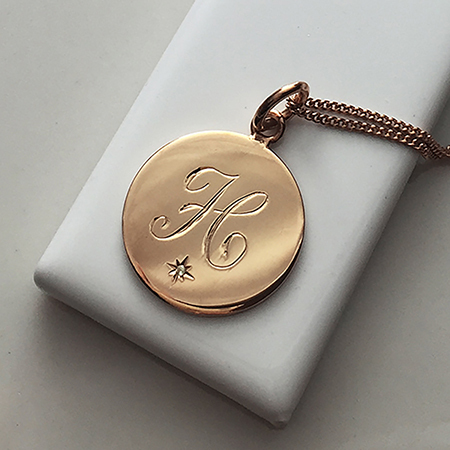 Our Diamond Initial Necklace makes for the most special gift for your loved one. she is to you with this meaningful gift. Ideal for your girlfriend, wife, mum, sister or best friend. You cannot go wrong with this classic timeless Diamond Initial Necklace. A great necklace that will be treasured forever, why not mark an extra special occasion? our Diamond Initial Necklace or Bracelet.